This was my third week in Iceland. And I already learned some lessons out of it. Some are fun, some are not. 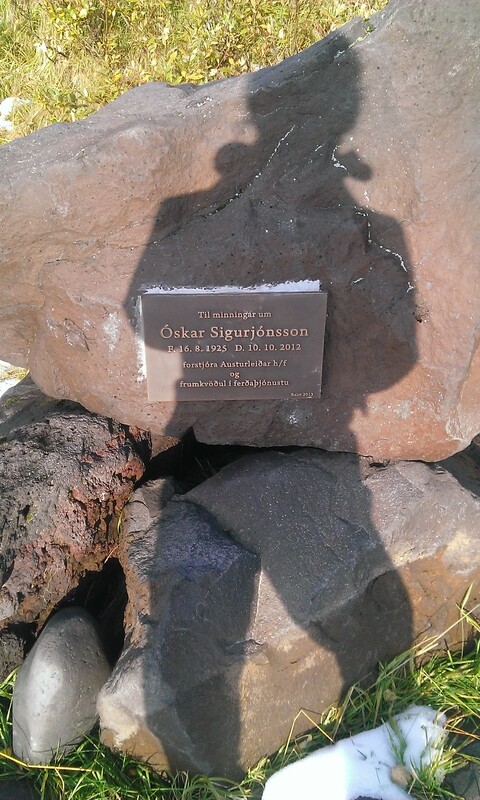 It was my first adventure when I arrived in Þórsmörk: Crossing a river by car. It is the only way to get to this remote place. So, the approach is quite challenging. The bus coming every day from Reykjavík is more fighting with the street than actually driving on it. First and most important thing to do, if you want to cross a river by car: You need a well-equipped car. Which means your car needs to be 4-wheel drive, should have a high suspension and some sort of snorkel. The snorkel gets the air for the engine through the roof or anywhere where the water can’t reach it. Besides that you need time and patience. You need time to get to know the river and its behaviour in the river bed. Then you can find your way through. It’s important to spot some small islands within the river and reach them, if it is a wide river. First of all: Avoid parts where the water seems calm as these parts are the deep ones. If you can see a lot of motion on the surface, the water might be shallow there. So, this also means you should cross the river at its widest point, because then chances are good it is not deep. Second fact to remember: Watch the river banks. They need to be plain enough to get your car out. Which brings me to the next important fact: Always get your car out of the river with both wheels at the same time. Otherwise you risk to tip over. And finally and maybe the most important fact: You have to go with the current, never against it, so the river can help you not to get stuck while carrying you. 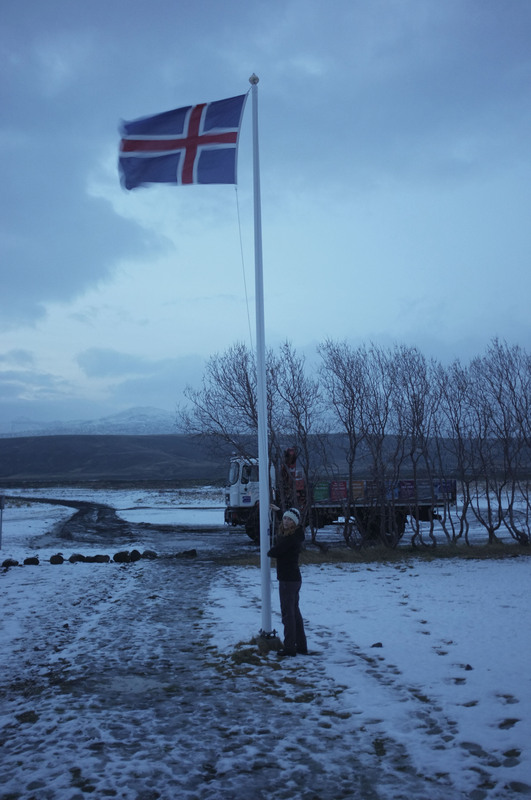 In Iceland it is forbidden by law to let the flag set during the night. So, one of my daily routine here is to set and pull down the beautiful Icelandic flag every morning and evening. Even if it is crispy cold and your hands freeze. For a matter of honour you should never let a flag touch the ground, which can be tricky if you’re shaking of cold hence getting clumpsy. Not to mention my short height: I am 1,65 m and the flag meassures 1,78 m. By speaking of honour: I’ve never done this before, neither with the German flag nor with any other, so this is a honour for me to set the Icelandic flag. It is so nice to be in the middle of nowhere and suddenly you can see this flag welcoming you. It is also a good indicator of how windy it is and from which direction the wind is blowing. This can be important if there is any gas pollution, like from Bárðarbunga eruption expected. Breathing can be a tad painful then. I always refused to drive an automatic car. Why? Because for me these cars are an affront to the driving skills of any capable driver. Binni said, that’s typical for young drivers. “When I was your age I also wanted to drive manual transmission cars only, but now that I’m a family dad, you can see the advantages of an automatic” (this statement was supported by a big smile). 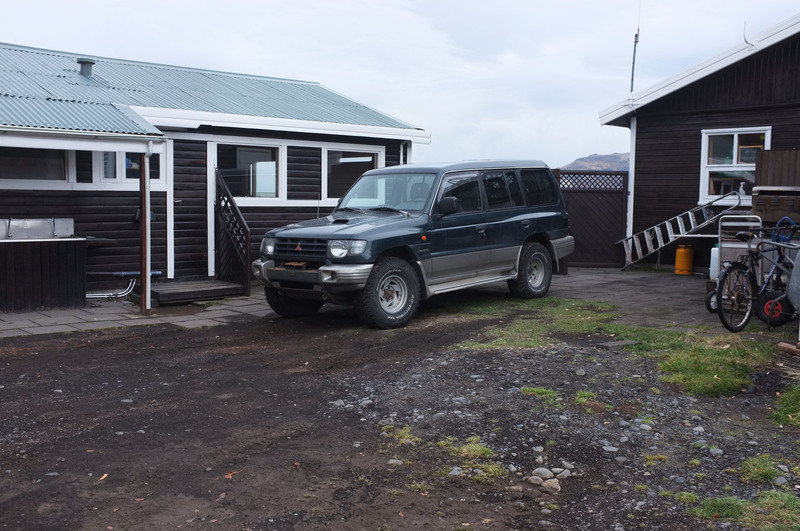 Since our white Toyota pick-up seems to have a hard time with the starter and a flat tyre, I had to use the automatic Mitsubishi Pajero to carry some wood to the fireplace. Jalen, my colleague tried to sell me the feeling of driving automatic by comparing it to a GoKart. And, indeed, it’s as easy as that. BUT, however still so boring as I expected it to be. Your left food feels just so useless, aweful! Last week we were lucky to enjoy beautiful weather. We soaked up sun and “high” temperatures (7° C). 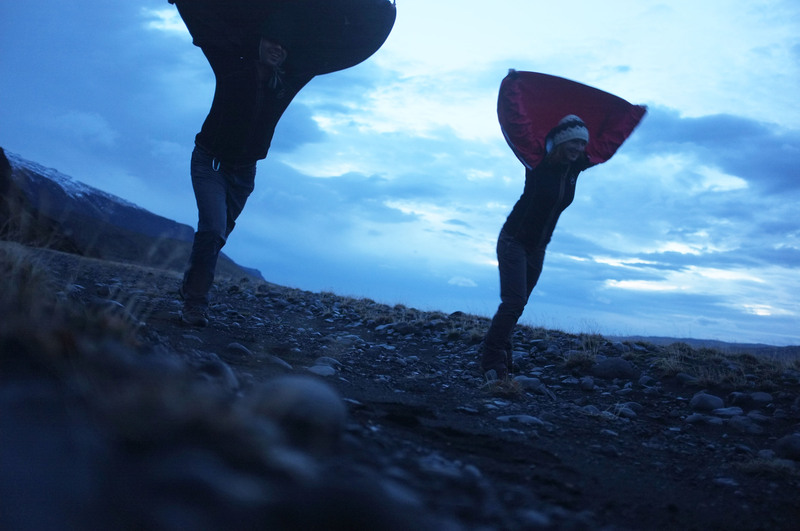 But at the mountain tops the wind was blowing strong. Zsófia, a student from University of Reykjavík, who stayed one week to finish a survey amongst hikers and tourists, showed me how to use your jacket as a sail. Take the edges of your jacket in your hand and put your arms from your back over your head. Then find your right position and lean against the breeze. It’s so much fun, especially when the breeze suddenly stops or changes direction and you have to be careful not falling down. I experienced a whole another dimension of silence in Þórsmörk, Iceland. The only thing you can hear during the day are birds twittering, rusteling trees, wind blowing and the sound of the river Markarfljót. The last one fooled me the first day when I was here, still used to the noises of a city: I stepped outside the staff house and for a short moment I was listening to the sound of a train, waiting for it to pass by. But wait: There are no trains in Iceland, they do not even possess a single inch of trail. Sometimes, when it carries much water, it can be a bit boisterous. But besides these noises you rarely hear anything else. You actually become really sensitive to sounds and I can always tell by far when the bus, super jeeps or any vehicle will come our way. Basically it is really relaxing, but every now and then this silence is becoming too “loud” and is quite overwhelming, if you’re a “townie”. The first things I’ve heard about Laugavegur, one of the 10 most famous hiking treks in the world, when I arrived were horrifying. You can listen to several stories of the locals about people who died there. My first impression was “This trek is murderous“. But it’s not only happening on the Laugavegur, it’s also not exceptional to die on the Icelandic Highland roads due to lost orientation or stuck in a river or while a glacier walking tour, keyword glacier crevasses and a lot of other scenarios. Both the modern and the old Icelandic literature is full of dramatic destinies like these. My mom had a point when she asked me how it is possible to die or get lost at a hiking trek in the 21. century? But obviously it is possible. Some people are just unlucky, some overestimate theirselves and some underestimate the powerful impact of nature on Iceland. So, hardly surprising I was concerned when I got a phone call of a search and rescue team last week, which was searching for a hiker who didn’t finish his hike. To make a search like this easier every hut at the Laugavegur keeps a list of every hiker arriving and leaving with his name, his last and his next goal and of course the date. I couldn’t find him on our list. I really hope, he was found safe and sound. But as my first week here was the worst concerning weather, including hail, storm, snow and rain chances are not too good. But I still hope he made it. This made me even more aware how precious, fragile and short life is. Besuche den Felsen Dimmuborgir und recke neben Ihm die rechte Hand zum Metalgruß in die Höhe (Pommesgabel) lasse Dich dabei fotografieren und ich like das Bild als Erster.